﻿Our SummitCare Penrith Aged Care home is ideally located within outskirts of Sydney’s western suburbs. Situated at the base of the stunning Blue Mountains, the 95-bed aged care home features an array of different living styles that cater to the varying levels of required care. All rooms are stationed on a ground level and residents are able to choose between single, double and companionship rooms. The general common areas at SummitCare Penrith have been designed and constructed to encourage socialising and engagement among residents and their visitors. Areas include dining and lounge spaces, where residents and their guests can relax, chat and interact as well as a garden and welcoming courtyard that are popular for barbecues and picnics in the warmer months. There is plenty of on-site parking is available for visiting friends and family members, as well as public transport close by. SummitCare Penrith residents have around the clock attention of an experienced and dedicated team of nursing staff as well as access to allied health services, which include physiotherapy, podiatry and speech pathology. From delicious and nutritious meals, cooked on site, to weekly hairdressing and personal hygiene services, nothing has been overlooked at this home in Sydney’s western suburbs. SummitCare Penrith is situated within a peaceful area of Sydney’s western suburbs, it never sees a dull moment. With a full activity program that includes everything from concerts and exercise programs to craft, pet therapy and fun social barbecues, there is always something to do and an activity to partake in. Our SummitCare Penrith home is one of the very few aged care homes in Sydney’s western suburbs offering specialised dementia care. The Magnolia wing has been carefully designed to accommodate up to 40 residents with early-stage dementia and wandering tendencies. This section of the nursing home is secure and equipped with the necessary amenities to deliver warm and professional care to those who require a little more attention. 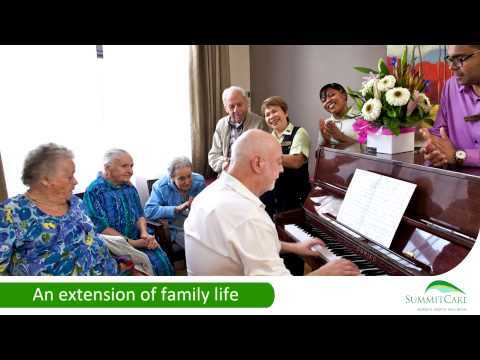 This specialist care is the very reason why SummitCare Penrith is regarded as one of the finest retirement homes in Western Sydney. At SummitCare Penrith, we pride ourselves on the professional calibre of our nursing staff. In order to guarantee and maintain the highest level of care possible, all SummitCare staff members regularly attend education sessions, ensuring they’re able to deliver a service that far exceeds the required standards and care offered by neighbouring aged care homes in the western suburbs. If you’re searching for aged care nursing homes or retirement homes in Western Sydney that provide a comprehensive range of support services from staff who care, then you can’t go past SummitCare Penrith.